Zee and I had a great walk at a local wildlife sanctuary on Saturday. Although, she did have to remind me a few times to walk instead of looking at all the fauna and flora. 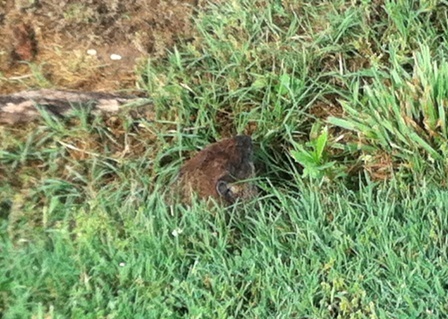 But we saw deer, groundhogs (see pic), frogs, toads, and some amazing views in general. And we still ended up with a decent time even though our other friend, who is older and in better shape than us, was not with us to keep us moving at a fast pace. She was running a 10K. I could be bitter about that, but I’m proud of her….and us for walking even though she wasn’t there to keep us accountable. I’ve come to realize a few things about myself. While I still want to lose more weight, that is becoming less motivation for me on its own. It’s not that I’m happy with the weight I’m at, it’s more that even at 219 pounds (what I weighed at the last weigh in), I weigh less than I have in many, many years. Of course, if I pop back up above 220, I’ll probably be remotivated! Haha! It’s the new year and Zee and I are getting back on track. Both with our “diets” and with the blog. Personally, I have 45-65 pounds left to lose, so hopefully this time I can do it. I lost 45 pounds before I slacked off back in April, and I’ve only gained about 5 of those pounds back. I know I can reach my goal this year. The first two days were tough. I think the first week will be. I know it’s all in my head, but I feel hungry all the time. It’s rough. Trying to eat lots of low cal things to get me through. But if the first week I don’t do as well as I should, I’m not going to complain…too much. I think this first week will be mainly about readjusting to eating a lower calorie diet and trying to eat right again. I have a love affair with fried and crunchy, which often are fried, foods. I need to learn to eat those in moderation. Or just on my free days. Haha! When I begin to give in to temptation I will do my best to remind myself both of the goal I want to reach and how much better I feel when I do eat right regularly. Hopefully, it will help. Zee and I hope to get some good articles and recipes up for you. Make this blog what we really envisioned from the start. Both a journal of our journeys and a resource and support place for you. What types of things would you like to see here to help you with your own journey? I lost 4.2 lbs this passed week! I know it’s probably largely water weight and the initial big loss when you start eating right again, but I’m still excited over it and going to celebrate it. The frustration is over working out, or rather the lack of working out. I was good Sunday and Monday last week and then dropped off. Lots of excuses, none of them great – tired, sore, no time. And now my dad is in the hospital again, which means I’ll likely not workout much, if at all, this week. So I’m frustrated at myself and life. Looks like I’ll be walking that 5K in a few weeks instead of running. Maybe I’ll find some time to run and workout though. At this point, I’d be happy with being able to run at least the first mile. Guess we’ll see how it goes. Mood: Determined…to run a half marathon. Um, sorry for the lack of status updates? And the lack of articles and recipes as well. It’s been a busy couple of month. Despite the busy month, I can officially say I’m back on the weight loss train. YAY! I have gotten back to tracking my food and calories, and I’ve managed to stay in the range I should. I have also done well with adding working out into my routine. To jump start my training for a half marathon, I signed up for a 5K at the end of October. I have mapped out my training through the date of the 5K and have done reasonably well with it so far. I may not be able to run the entire thing, but I’m going to do my best to run as much of it as I can. Originally, my goal was simply to be able to run in a 5K next year. However, a few weeks ago, a friend sent out an email to me and a couple of others, asking if we would run a half marathon with her in October 2012. She wants to run in the Woodrow Wilson Bridge Half Marathon. That’s 13.1 miles. A 5K is 3.1 miles. So, basically, said friend asked me to add 10 more miles onto my goal for next year. And I agreed! Yup, I may have lost my mind. In all honesty, though, I’m certain this is completely doable. 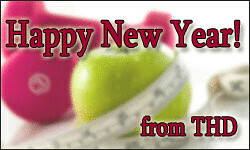 If I stay on track with the weight loss, it will all be off by May 2012. So weight will not be an issue when it comes time for really hunkering down and training for this half marathon. Most training schedules are 12 weeks anyways, and I have an entire year! Yup, doable. My ultimate hope is this new goal will push me even harder and will help me to continue to lose weight and get fit, as well as getting me into a workout oriented mindset. I needed to workout regularly, not just go in spurts, and this will force me to do that. Sorry for no update last week. I gained a couple of pounds, going up to 220.8. It was depressing even though I knew a portion of it was water weight. I’m really not making excuses for the weight gain. My ankles and feet were swollen. I could see it. I’m guessing the culprit was the fried foods Friday night and the alcohol Friday and Saturday nights. (Which are also a reason for the weight gain, double whammy there.) I was actually surprised I had so much water weight though. I haven’t had a problem with retaining water since I went vegetarian, one of the many reasons keeping me a vegetarian. Onto this week. I lost weight, going back down to 215.6. I didn’t do anything differently, but I suspect what I lost was mostly the water weight, and perhaps some genuine weight as well. I’ve been trying to eat healthier, although I haven’t been counting calories. Thus the reason I’m disappointed in myself – I know I should count calories and exercise, but I have not done either all week. That brings us to determined. I am determined to exercise this week. My goal is to do 30 Day Shred before work, even if it means waking up at 4am, and then walking at least 2 miles once I get home from work, as long as it’s light out. I don’t know what my schedule is yet, but if it follows the same patterns I should be able to walk at least 4 or 5 times this week. All that exercise may be a bit much, but I’m actually hoping it jump starts me into exercising regularly. Even when I was doing well losing weight by counting calories alone, I didn’t do so well on exercising. That’s not acceptable to me anymore. I feel I have to start exercising. Part of that determination is because I know with the free employee meals at work, it’s going to be hard to be specific when it comes to counting calories. It’s also going to be tricky to stay healthy doing it. Yes, I could and should take my lunch to work and it would solve my problems, but until I hit the grocery store to get some packable foods or start cooking and packaging leftovers, I’ll be eating at work…or Subway, my back up plan when the work meal is all meat. Workout to 30 Day Shred at least 4 days this week. Walk 2 miles at least 3 days week. Work harder at counting my calories. To that end, I joined SparkPeople, since they have an app for the iPhone (& a few other phone types) to count calories. It seems to be working for Zee, so perhaps it will work for me as well.